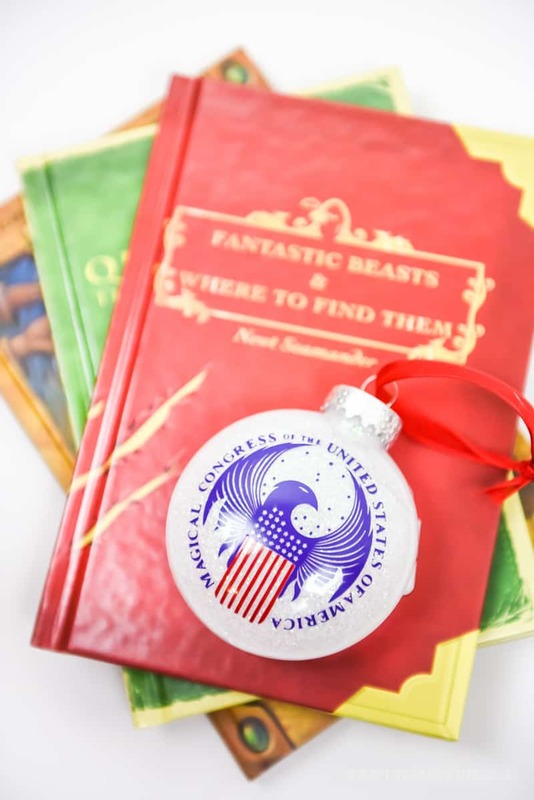 Go nerdy this year and decorate your Christmas Tree with these Fantastic Beasts & Where to Find Them inspired Harry Potter ornaments! Every winter Chris and I like to sit down and re-watch all of the Harry Potter movies and I re-read all of the books. I love getting back into that world and now that we have a one year old I’m doing my Potter-reading with him before bed. I figure the first few books aren’t scary, so we’ll just keep re-reading them until he gets older! I’m really excited that now a whole new era of Potter-esque movies are being released, because that means I can relive the excitement with my child. He may be old enough (depending on how often the movies are released) to go see the last one in the theater with me and I’m hoping we get to share that experience together. He is going to grow up with Potter love in his blood (ohh yea!) and won’t even bat an eye when he’s old enough to appreciate these Harry Potter ornaments! Because if I raise him right, he’ll be just as obsessed as his mama! Chris came home early from work so I could go see a showing Fantastic Beasts last night. I just couldn’t wait and since he isn’t as big of a Potter fanatic as I am he figured he could wait to see it when it’s out on DVD. Me, not so much. I’ll admit that it was odd to see a movie about the Wizarding World in which none of the characters I know and love were in. I wondered how they were going to make a movie out of a short and sweet book that J.K. Rowling had put out years ago, and I was pleasantly surprised. There were a few things that left me scratching my head but overall I was happy with the movie. Also, I want a Niffler. Since my favorite part of the movie was getting to see the inside of the Magical Congress (the American version of the Ministry of Magic), I decided to make the logo into an ornament. It was super tough but worth it! And of course, I also had to make some Ilvermorny ornaments to go with it. Want to make your own Magical Harry Potter Ornaments? Here’s how! 1. Start by putting glitter in your bulbs, you can find the tutorial here. 2. Cut out your designs with your Silhouette. These deigns are all intricate and my regular blade wasn’t cutting them well. I ended up buying a Silhouette Studio Designer Edition to help with the small details on the designs. It worked so much better and the cut was deeper and more precise! 3. Place transfer paper over your design and rub the paper onto the design so it’ll stick (I used the scraper Silhouette tool). 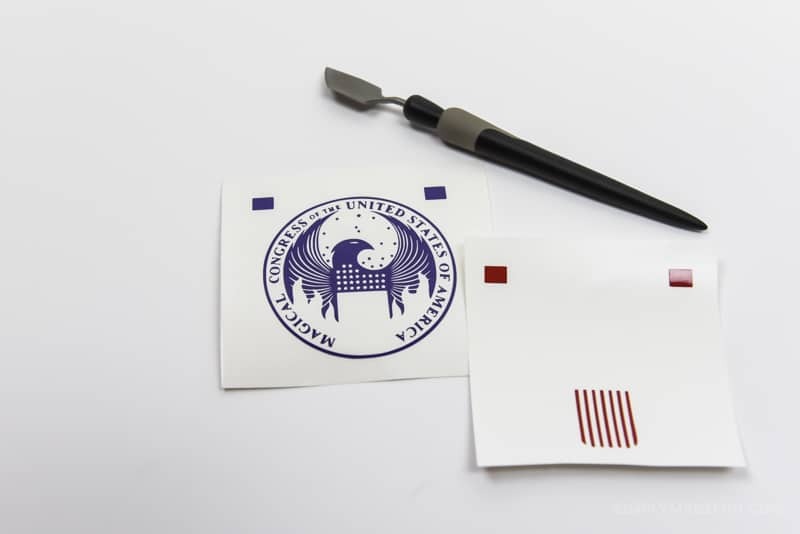 PRO TIP: If you pull up the transfer paper and pieces of the design are left behind, lay the transfer paper back down and use the scraper tool to rub the design down again. Keep doing that until you can successfully pull up the entire design with the transfer paper. 4. If you’re doing the Magical Congress design and are trying to line the colors up correctly, make sure you cut out tiny boxes at the top of the the design (for each color) and then line them up as you lay the colors on top of each other. This will help you line up your design right every time! Just remember to take the squares off before you put your design on the Christmas bulb! 5. Cut tiny slits in the transfer paper before you put your Harry Potter designs on your Christmas bulbs. Because the bulbs are round it’s harder to successfully lay large designs on them. Cutting slits will help you get a smooth transfer! 6. Line your design up on your bulb and slowly press it down, being extremely careful that you don’t get any bubbles in your vinyl. This took me a while because I went super slow. I honestly don’t think I would’ve been able to line up the Magical Congress design on a round bulb. I’m so glad I used the M&M shape and highly recommend it if you want to make Harry Potter ornaments of your own! This is just the beginning of my Harry Potter themed tree for this year and I cannot wait to show y’all the finished product! I figured that with the new wizarding movie coming out I had to represent the American school and Congress, and they will go nicely with the rest of the Harry Potter ornaments on the tree. Are you going to go see Fantastic Beasts and Where to Find Them? What part are you looking forward to the most? Go here for more Harry Potter Silhouette Crafts! And get more Harry Potter crafts & recipe inspiration from my favorite bloggers here! 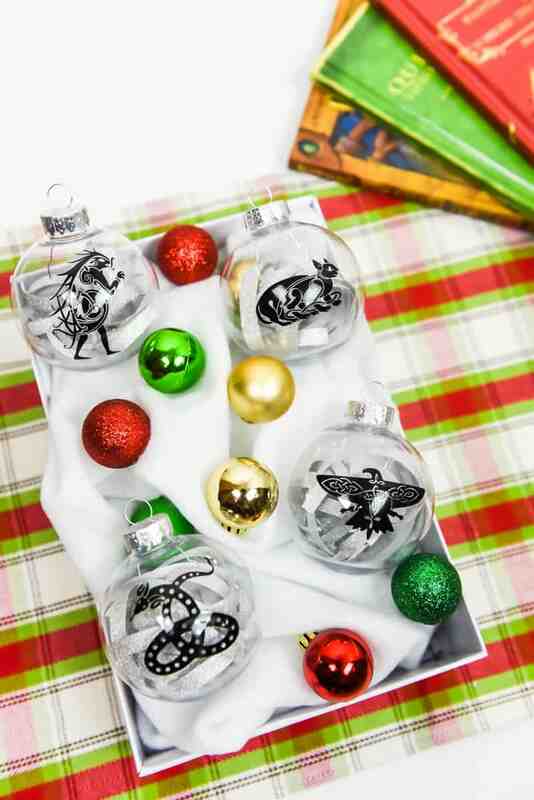 These ornaments are great! They came out so cute! I’m excited to look at all the other HP goodies too!